A complete recipe guide to weaning babies and toddlers into solid foods from the UK’s #1 children’s cooking author. 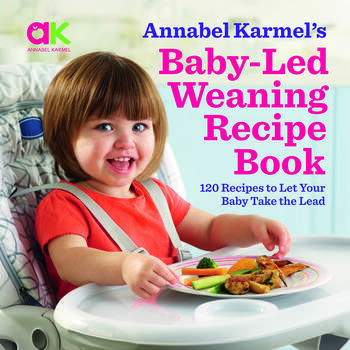 For 25 years, Annabel Karmel has been the person families turn to when it comes to delicious, nutritious recipes for weaning children onto solid food. While lots of parents start out with smooth spoon-led purees, baby-led weaning (BLW) is fast growing in popularity. But you don't have to choose one or the other. Baby-Led Weaning Recipe Book is designed to offer a flexible approach to weaning. These expert recipes are designed to offer a flexible approach to weaning with simple methods and everything parents need to know about getting started with self-feeding. Baby-Led Weaning Recipe Book is a must-have resource for parents and is the perfect standalone guide for those wanting to explore this method exclusively. ANNABEL KARMEL is the mother of three children and the UK's leading expert on feeding children. She works with leading US parenting websites such as Parents.com and has appeared on many TV shows, including Today show and The View. She created a popular app, Annabel's Essential Guide to Feeding Your Baby & Toddler.